An elevation block for sewers would be a large, complicated shape for a mold. A potentially simpler way to create them might be to mold half of the block twice (so that each piece was half of a cube "cut" diagonally, as one might cut a very thick sandwich) and glue those two pieces together back-to-back. GODofwar wrote: I think I stand outvoted! I didn't mean that the sewers should be historical....only that even in a fantasy setting they are utilitarian and not designed as their own city. 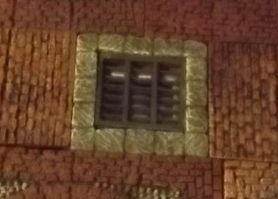 My tendency is to use dungeon tiles to make the less sewer-y parts. It is not clear to me you have been out voted. I would like to add Griffin Tamer style grates. Both sewer style and brick. I would like to add Griffin Tamer style grates. Decorations seem like a good idea. More styles and a way to purchase more has my vote. Are not deep water and wide sluices canals,rivers or moats? If so I think they are a separate topic. I think I stand outvoted! 1" straight walls and/or corners (convex and/or concave) with decorative bits, like seahorses or mermaids or dolphins or fish. A Hole Wall (or an accessory that fits over the Hole Wall) that matches the classic DF Demon Arch. jackattack wrote: Full size (2"x2") floor tiles, some with grates. Full size tiles, half floor and half water, split diagonally. A ramp, designed to be framed with two convex curves, that water would flow down from street level? Can't put a mini on it, but it makes a good spawn point, or a transition between stacked levels. Full size (2"x2") floor tiles, some with grates. Like Griffin Tamer Trap doors. I would like them added to the sluice ways as well. Brick or solid, square or round columns,A larger, square column with a 2"x2" base. I would not need many. A very easy modification. Sewers are just sewers. You want to get variety? I agree more than I do not. I do not see the need for it. The same for deep/ filled with water. You want a total redesign. Try to model it. You will quickly see my point. Aquila, and the approaches to the Phantom of the Opera's lair and the Addams' family vault. While large sewers are uncommon, they are not unheard of in RW or fiction. And if you want to put your characters in a "dungeon" to break up a city adventure, or give them an alternate route through the city, or give the whatever horde a place to infiltrate and hide, sewers make a decent alternative to a standard dungeon. And it isn't necessarily just waste disposal, it can also be water drainage. If there is heavy rain or occasional river flow increase, a good drainage system can prevent flooding. For that matter, if you use floors instead of sluice ways, sewers can stand in for steam tunnels (with a little modification?). For my own purposes, I would use open water tiles instead of the sluice ways to create underground waterways, which informs some of my suggestions above. This also makes sewers viable as an underground "neighborhood" where the land dwellers and the local aquatics interact. I do see the point that we already have all of the pieces we need to make sewers. All we need to make dungeons and caverns are straight walls, corners, and floor pieces. If your reality keeps sewers from being anything other than basic waste management, then the Sewer Set is basically finished. If enough people imagine it to be more, then there is room for expansion. A straight wall with an extension on top to match the straight sewer drain street piece. GODofwar wrote: I'll buck the trend. Wide sewers - cut existing sluice edges off, use the center to make wider, put it back together if you want to use it normally. How wide you think sewers get, anyway? Most sewers weren't really man-sized anyway. Its just a place for s.....excrement to flow to its final resting place! This also depends on the size of the civilization and their level of advancement. The Romans had a number of systems that were only slightly smaller than the current DF sewer design if done in that scale. In a few cities some were larger and had various clever bits to help avoid clogging or backing up. It wouldn't take much of a stretch for a fantasy world to possibly have larger sewers. Perhaps certain kinds of nasties were turned loose and locked in to help clear the sewers of muck and junk. The sewers may also need to handle the waste of rather large things from time to time depending on how "high fantasy" you get. Midden carts can get impractical in a place the size of Waterdeep, for example, and things like gryphons and drakes may be mounts for high profile adventurers. Not to mention some fantasy races "excrement" may not be that similar to an animal's and may require larger spaces that are occasionally flushed with far larger and more violent quantities of water. Given both the above info sets, it isn't unreasonable to envision some additional sewer creations making sense for the line. Granted, if you want to go purely historical all it needs is a couple transition pieces for dungeons, caverns, waterways, and perhaps catacombs to be pretty complete. I just think that fantasy worlds likely have room for a bit more expansion of the line if Stefan and crew are so inclined. I don't recall if you play in a fantasy or historical setting, but there could be a whole ecosystem down below that warrants a large sewer system.